If you love tofu, you are going to love this recipe! Not only is it easy to prepare, it is also delicious, crunchy and full of flavor. Tofu is remarkably easy to prepare, and it surprises me to hear people say that it isn't. It can be flavored however you like and prepared in millions of ways using every kind of spice and flavorings from the globe! 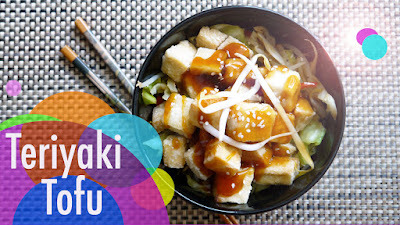 This recipe is for a thick teriyaki drenched tofu that is both sweet and savory. Soy sauce is mixed with ginger, sugar and starch which acts as a thickening agent. When poured over the tofu, it is more like a glossy-gravy that is so tasty, you will want to drink a glass of it. Cut the tofu into small cubes. *This is just a suggestion, and if you want larger slabs of tofu, feel free to make your pieces bigger. When frying tofu I like smaller pieces because they cook faster and more evenly. Dust each piece of tofu in rice flour or corn starch. In a large pan, heat enough oil to cover the tofu and add several pieces once the oil is hot. *To check the oil's temperature, submerge half a toothpick in the oil once it is heating. If it begins to bubble, it is hot enough for frying. Fry each side of the tofu until golden brown. Remove each piece from the oil and drain on paper towels. Add all ingredients to a sauce pan and stir gently over medium heat. After a few minutes the sauce will thicken and will be ready. Drizzle this sauce over the tofu, or simply use as a dipping sauce.